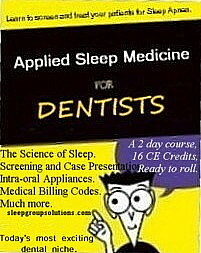 present an exciting training course on Dental Sleep Medicine with an amazing offer. Register here with code FC500. Of the next three patients that walk thru your doors, one will be a victim of a sleep breathing disorder….will YOU be able to identify and treat that patient? Today’s “Hot Button”, Dental Sleep Medicine, will make YOU stand out, be sought out and become your uniqueness to serve the needs of 34% of your existing patients and… to attract many new patients. You will be able to offer not only your EXCELLENCE but also DIFFERENCE. In this sluggish economy, where there is a perception of “financial doom”, dental consumers have a tight hold on their wallets; dental service acceptance shows a concerning drop. Your First Class Service and Patient Engagement are expected as basic “givens”. But what is your clinical niche? Are YOU the dental practice they must go to? Are you the only practice around that is the “Snooze Dentist”, the “Snore Dentist”? Are you the “Sleep Dysfunction Dentist”? Dental Sleep Medicine is where Teeth Whitening was 20 years ago. It is the “hot button” where Implant Dentistry was 10 years ago.